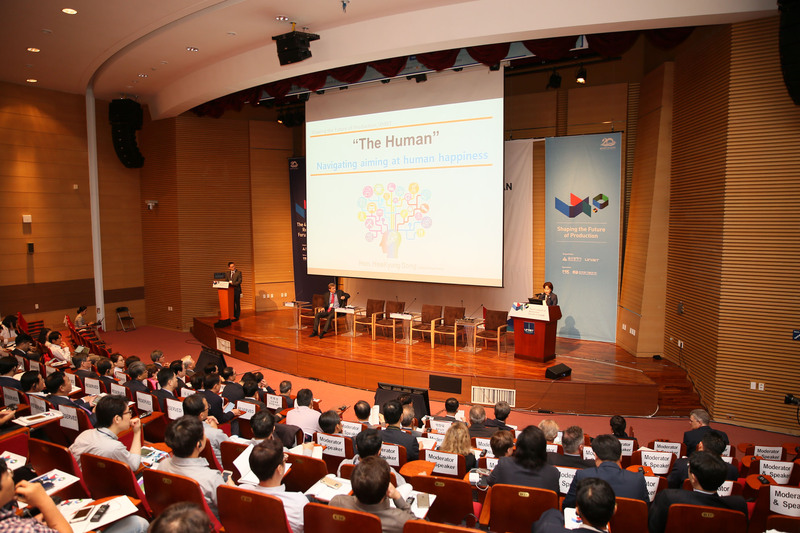 Keynote speakers from the '4th Industrial Revolution Forum in Ulsan' are having a panel discussion. The forum was hosted by Professor Franklin Bien at UNIST. From left are Professor Bien, Justin Wood of WEF, Vice President Hyun-Soon Lee of Doosan Infracore Co., Ltd., and Commissioner Young-Sup Joo of SMBA. 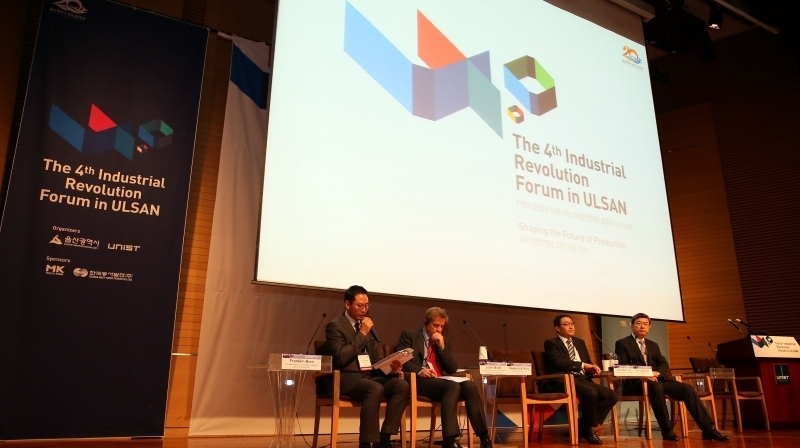 The 4th Industrial Revolution Forum in Ulsan will be held at UNIST from Sept. 13 to 14, 2017. 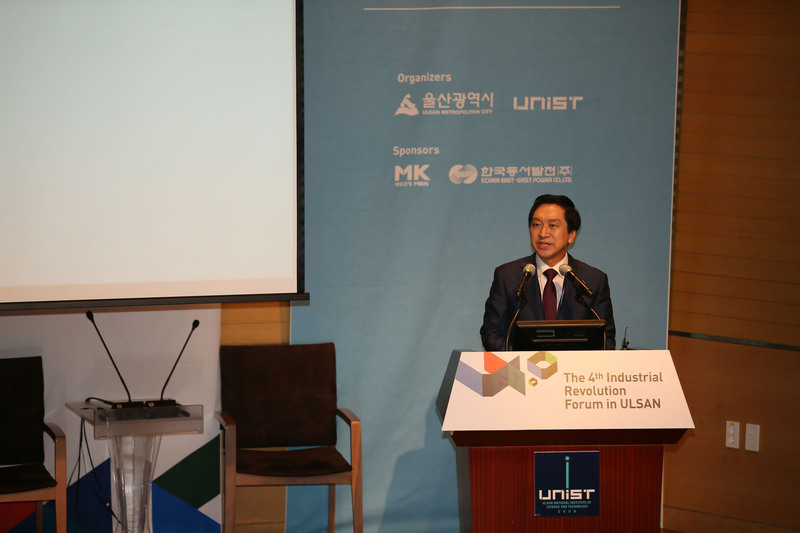 The Fourth Industrial Revolution Forum in Ulsan finished successfully at UNIST. 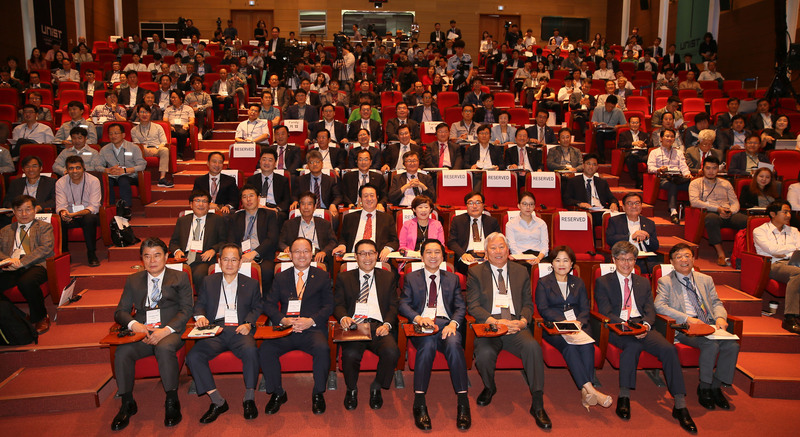 The forum, which was held from September 13 to 14, 2017, was attended by approximately 400 participants from 12 countries worldwide, including China, Japan, United States, and South Korea. 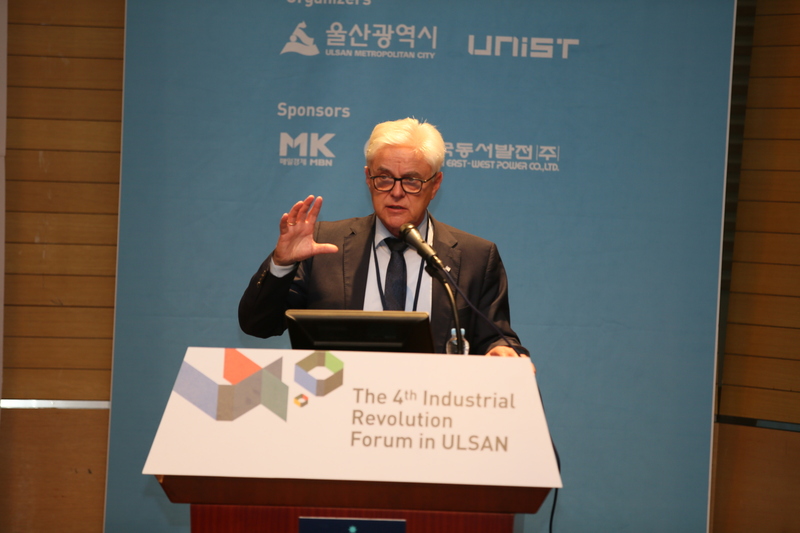 This two-day event featured a host of presentations on Fourth Industrial Revolution by internationally renowned guest speakers, as well as welcome remarks by Mayor Gi-hyeon Kim of Ulsan City and congratulatory address by President Klaus Schwab of World Economic Forum. 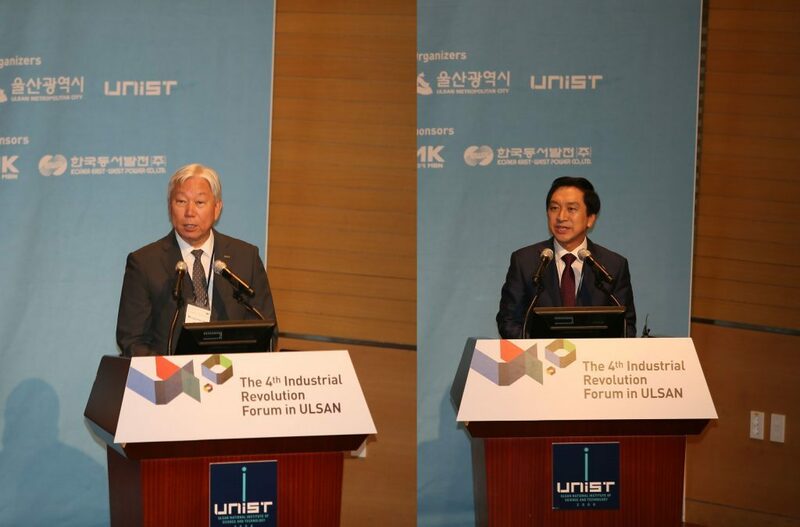 President Mooyoung Jung of UNIST and Mayor Gi-hyeon Kim of Ulsan are welcoming guests at the 4th Indistrial Revolution Forum in Ulsan. This forum is also linked to the 20th anniversary of Ulsan’s elevation to the metropolitan city. 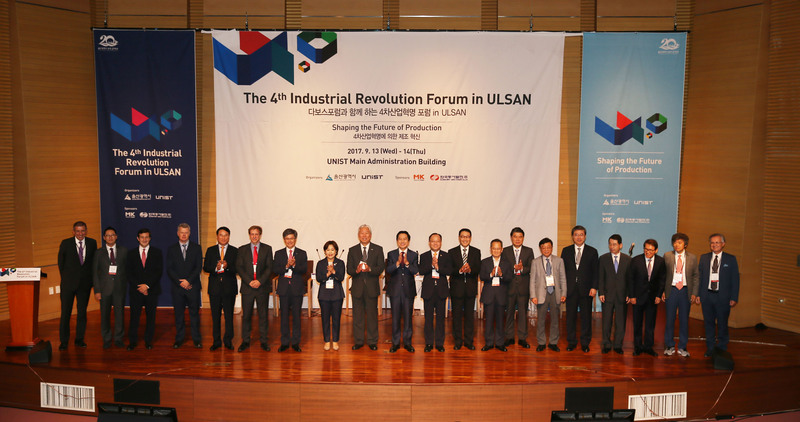 Ulsan is a manufacturing-oriented city that boasts large companies, such as Hyundai Motor, Hyundai Heavy Industries, Samsung SDI, SK Energy, as well as many other small and medium-sized enterprises. It is, therefore, a city with optimal infrastructure to realize promise of the Fourth Industrial Revolution. Justin Wood, Head of Asia Pacific and Member of the Executive Committee of World Economic Forum is delievering a speech at the forum. 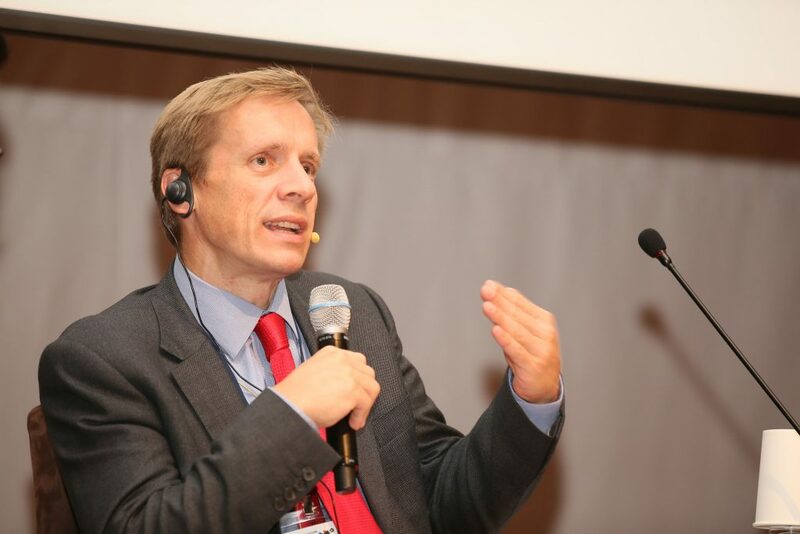 The forum featured a keynote speech by Justin Wood, Head of Asia Pacific and Member of the Executive Committee of World Economic Forum. 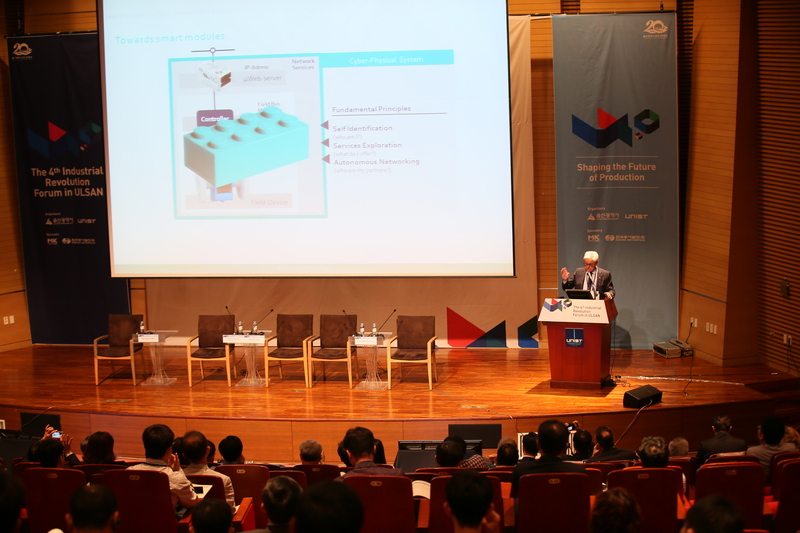 During his speech, Mr. Wood talked about some of the activities that the Committee of the WEF are currently working on, as well as the actual application of new technologies, such as 3D printing and Artificial Intelligence (AI) to the existing manufacturing systems. 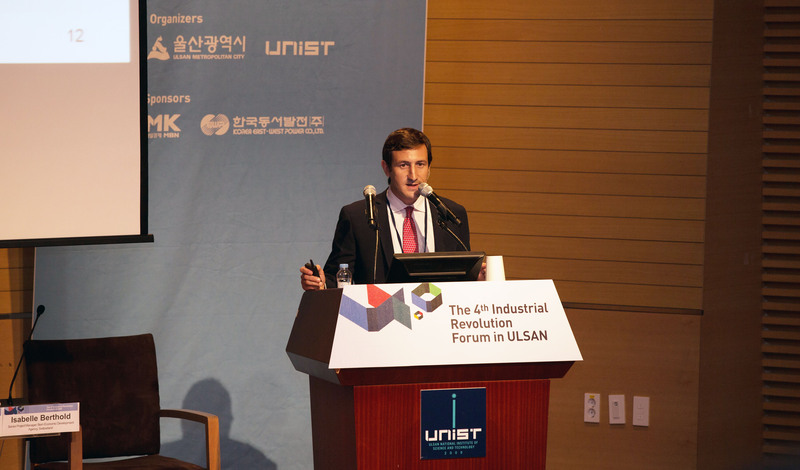 “The future of production, officially announced by WEF, will become the core agenda for the Fourth Industrial Revolution in the future,” says Justin Wood. 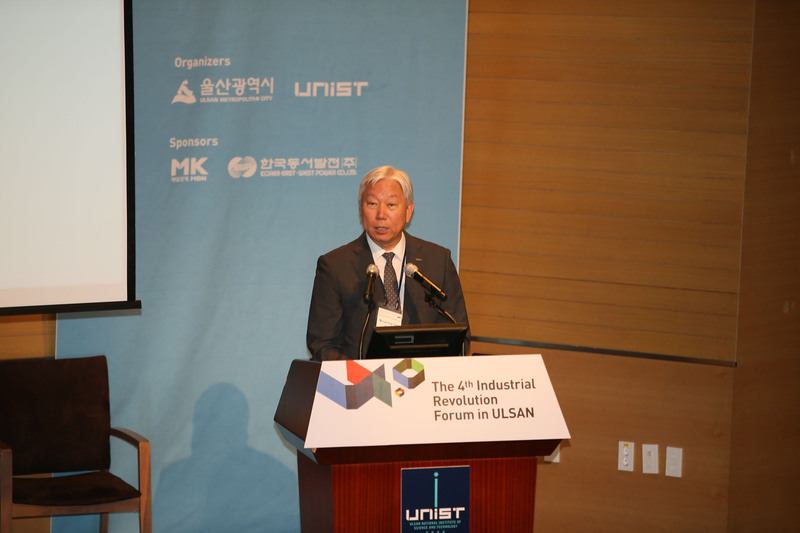 The forum also featured a plenary speechs by Vice President Hyun-Soon Lee of Doosan Infracore Co., Ltd., Commissioner Young-Sup Joo of the Small and Medium Business Administration (SMBA), and Heekyung Song, member of Korea’s National Assembly. 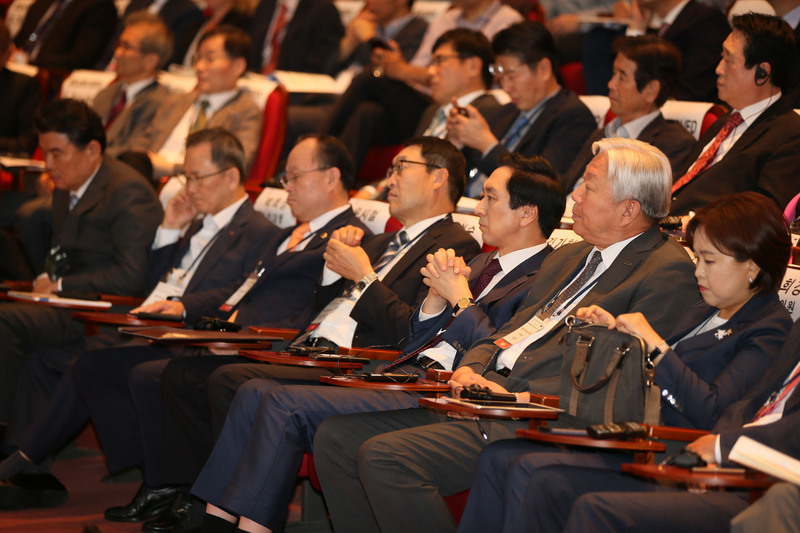 Plenary speechs, delievered by Vice President Hyun-Soon Lee of Doosan Infracore Co., Ltd., Commissioner Young-Sup Joo of SMBA, and Heekyung Song, member of Korea’s National Assembly. The most eye-catching presentation at the forum was the speech by Francis Betty, Future of Production Lead, World Economic Forum. Part of the speech, entitled ‘Country Readiness for the Future of Production’ dealt with the current state of the world’s manufacturing industry in preparation of the Fourth Industrial Revolution. Mr. Betty grouped some of world’s 100 manufacturing countries into the following six categories based on their level of preparedness for the Fourth Industrial Revolution (Global Leaders, High potential, Legacy Champion, High Potential, Legacy Champion, and Follower). The Global Leaders are those countries that today, have a very strong and powerful structure of production. Francis Betty, Future of Production Lead, World Economic Forum is delievering a speech at the forum. Based on his analysis, the countries that are best prepared for the Fourth Industrial Revolution include Germany, Switzerland, and the United States. Among Asian countries, Singapore, Japan, South Korea, and China belong to the Global Leader group, with Singapore being the strongest. Moreover, among world’s 20 leading countries, the level of technological innovation in South Korea was placed third, after the United States and Germany. Such results indicate high level of competence, capable of creating technological advancement and innovation that are believed to be the keys to Fourth Industrial Revolution. However, the level of human resources who can work on developing new technologies remained in ninth place. This means that the ability to respond to new changes and the level of education for nurturing global talents are far behind other countries. 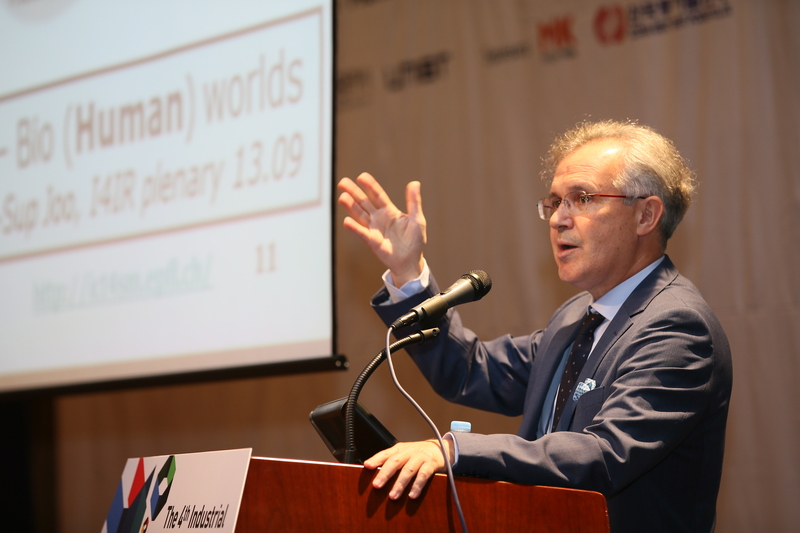 On the second day of the Forum, Professor Dimitris Kiritsis at EPFL in Switzerland and Professor Detlef Zuehlke at the University of Kaiserslautern & Scientific Director DFKL Gmbtl delievered special lectures on the “Future of Manufacuring” and “Smart Factory”. The forum also include exhibitions on innovative technology, such as smart factory, Artificial Intelligence (AI), seawater battery, advanced robot, new and innovative renewable energy systems. 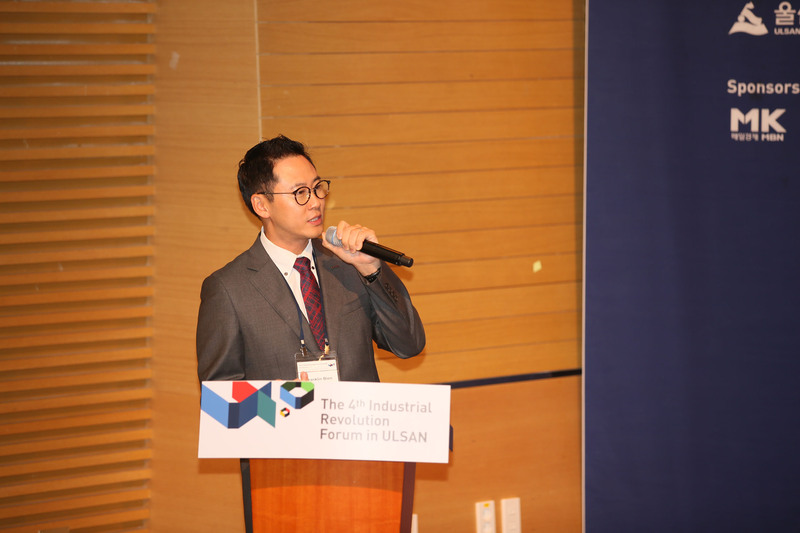 Besides, the forum will also feature 3D Printing Gala in Ulsan in which more than 50 local 3D printing companies will also be present for exhibition.